Copper hanging pot racks are fantastic kitchen accessories that help with both organization and aesthetics. Your pots and pans take up a large amount of space in the kitchen cabinets and a pot rack utilizes space in your kitchen that would otherwise be empty while providing you with more cabinet space. In addition, copper kitchen accessories are beautiful right out of the box as well as for years to come. Over time the copper pot rack will start to change color and bring a completely different aesthetic look to your kitchen. There are several different styles of copper hanging pot racks to choose from and some of my favorites are pictured below. Four of the pot racks pictured above are meant to be mounted to the ceiling, most likely over a kitchen island or above the stove. Typically the copper pot rack is attached to the ceiling by at least two brackets and then the actual rack hangs down from those brackets by chains or other copper pieces. The pots and pans hang from S hooks that hang on a grate that covers the entire copper pot rack. You can also use this grate level as an additional storage shelf. If you have chosen a ceiling mounted copper pot rack then your next choice has to be what shape you want that pot rack to be. Your choices included oval shaped, rectangular shaped, or circular shaped. Rectangular or oval pots racks are best suited for hanging over a kitchen island where there is more real estate underneath. 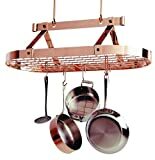 The circular copper hanging pot rack is better suited to hanging over a stove where there is less room due to the cabinets that extend out on either side. The major difference between the two oval shaped copper handing pot racks pictured above is that one of them is copper and one is only copper plated. Copper plated pot racks are typically made of steel with a thin layer of copper on the outside. They have two advantages over solid copper hanging pot racks. First, they are more sturdy because copper is a soft metal and they are less expensive. Both types of hanging copper pot racks will age over time and get a nice patina that will help with the aesthetics of the room. Wall mounted copper pot racks like the two pictures above are still considered hanging pot racks because the pots and pans hang from them using S hooks just like with the ceiling mounted pot racks. There are some differences though. First, wall mounted copper pot racks typically hold a lot less than the ceiling mounted variety because there is less room to install the pot rack. Second, they require a wall with no cabinets which is hard to come by in a kitchen. Another difference is that the wall mounted hanging copper pot racks are not as efficient use of space. In order to be able to reach the pots and pans you store on the wall mounted hanging copper pot rack, you need to install it fairly far down on the wall since you will also be reaching in with your counter in the way. Then, you cannot store anything on the counter below because the pots will hang down too far. You may gain cabinet space, but you loose work surfaces on your counter tops. There are two shapes for wall mounted copper pot racks you can choose. The first is a straight line and the second is a half circle. The circular variety will obscure more of your counter top, but you will be able to store more items and be able to reach them more easily.